WASHINGTON, D.C. -- As has generally been the case for the past decade, Americans continue to be about twice as likely to want to lose weight (51%) as to say they are seriously trying to do so (26%). However, despite the increasing focus on the negative consequences of obesity, the percentage of Americans who would like to lose weight has gone down, not up, since the early 2000s, while the percentage saying they are making a serious effort to lose it has been consistent. The margin between those who want to lose weight and those who are trying has shrunk an additional point from last year, reaching its smallest yet of 25 percentage points. These results are from Gallup's Health and Healthcare survey, conducted Nov. 6-9. Gallup has asked American adults about their weight and their attitudes toward it since 1990, and on a yearly basis since 2002. 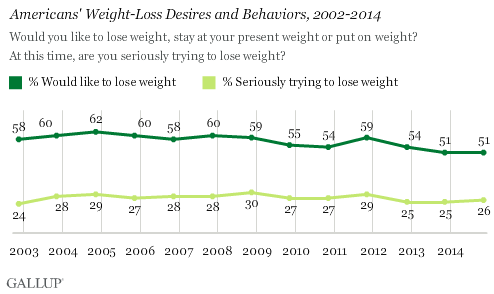 Desire to lose weight was relatively consistent between 2002 and 2008, at about the 60% level -- peaking at 62% in 2004. But this desire has flagged in recent years, down to its lowest level of 51% in the past two years. The percentage of Americans who would like to stay at their present weight has varied even less, ranging from 32% to 41% since 1990. The current reading of 40% is one of the highest percentages of Americans who are happy with their weight since 1996. Americans' descriptions of their current weight situation are also at odds with reality. Although slightly more than half of Americans would like to lose weight, only 36% describe themselves as either "somewhat" or "very overweight." More than half of Americans say their current weight is "about right" (56%). This doesn't mesh with actual figures. In reality, 35% of Americans are overweight, and 28% are obese. 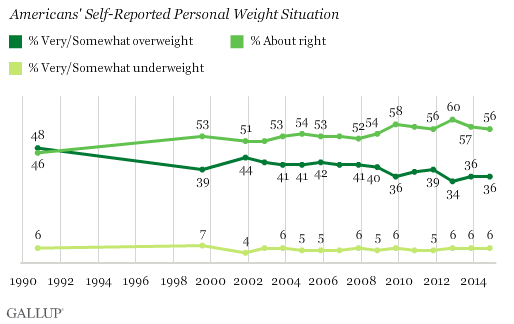 Mirroring the decline in the percentage who say they want to lose weight, Americans have become more likely to say they their weight is "about right" in recent years, peaking at 60% in 2012. At the same time, Americans have become less likely to say they are very or somewhat overweight. In 1990, 48% admitted to being overweight to some degree, but this fell to 39% by 1999. This figure has hovered in the 30s since 2009. Although most Americans don't describe themselves as overweight, six in 10 say they are heavier than they would like to be, based on self-reports of their actual weight and ideal weight. A majority of men (56%) and a greater majority of women (65%) are at least a pound heavier than what they describe as their ideal weight. On average, American women are further (20 pounds) from their ideal weight than men (12 pounds). While the average ideal weight for a man is 182 pounds, the average actual self-reported weight is 193 pounds. Women's average ideal weight is 137 pounds, while 157 pounds is their self-reported average actual weight. It is not known how accurately Americans report their weight; if their reports tend to be lower than reality, the discrepancy between actual and ideal could be higher than these reports indicate. These data show several interesting and important discrepancies in the ways that Americans look at their weight situations. For whatever their personal reasons, about half of Americans want to lose weight, while only half of that percentage are actively trying to. Additionally, only a little more than a third of Americans describe themselves as overweight, even though the majority say that their ideal weight is less than their actual weight. These results suggest that many Americans don't want to present or view themselves as overweight even while being more forthcoming about the fact that they weigh more than their ideal weight and would like to lose weight. 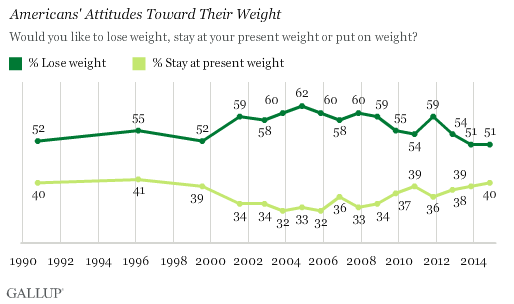 Perhaps most importantly, the longer-term trends in these results show that fewer Americans now than in the past say they are overweight, and fewer say they want to lose weight -- even though the negative medical effects of being overweight have increasingly become evident. Results for this Gallup poll are based on telephone interviews conducted Nov. 6-9, 2014, on the Gallup U.S. Daily survey, with a random sample of 828 adults, aged 18 and older, living in all 50 U.S. states and the District of Columbia. For results based on the total sample of national adults, the margin of sampling error is ±4 percentage points at the 95% confidence level. For results based on the total sample of 430 men, the margin of sampling error is ±6 percentage points at the 95% confidence level. For results based on the total sample of 398 women, the margin of sampling error is ±6 percentage points at the 95% confidence level.